Landmark Bingo Review | £15 No Deposit + £50 Bonus! Landmark Bingo is a top online bingo site for 2017! If you're looking for a site with a mission to make sure you have the best online bingo experience, then look no further than Landmark. The site is full of real London sights and images, making your whole online experience that much more enjoyable. Moreover, there is someone online at every hour of the day to answer any questions and to give you support in any way you may need it. Landmark Bingo offers plenty of incentives to sign up, but perhaps the biggest reason is its welcome bonus that includes £15 FREE no deposit bonus. This lets you get started and playing your favourite games without spending a penny. With the free cash you can test the site out and if you like it you can claim a massive 600% Welcome Bonus. This means that when you make your first £10 deposit you'll get £50 extra to start playing with £60. There's more…you'll get 350% on your second deposit, 300% on your third and 100% on all cash reloads. There are fab promotions every day of the week! Some of the top promos include Session Bingo, Free Bingo, Chat games and Break Time Quizzers. You can also get rewarded for playing with Loyalty Rewards and pick up bonuses for Refering a Friend. The reels are also bursting with Jackpot Specials, with chances to snap up £500 daily boosts, £500 Weekly Wins and £1,000 Monthly Moolah. If that's not enough, you can also pick up 100% cash prizes on every deposit! Then get social in the Twitter and Facebook pages to stay in the loop of the latest offers. You do not want to miss out, so grab the Landmark Bingo no deposit bonus, claim your generous Welcome Offer, play all of the hottest games and get ready to win big! There are loads of games to choose from at Landmark so you're bound to have fun and win big all day! You can play 75, 90, 80 and 30 ball bingo plus loads of casino games like online slot machines and scratch cards. You can spin to win in popular slots like Monkey Business, Wizards Castle and Honey Bees just to name a few. There are also Free bingo and slot games, and of course loads of bonuses and prizes to be won! The site has a very friendly bingo community, so when you're playing and winning, you can also interact with your chat hosts and meet fellow players on the site. Want to stay up to date on everything that's going on at Landmark Bingo? Visit this page or go to their blog regularly to stay in the loop! There are weekly specials, exclusive bonuses, promos and more! Landmark Bingo’s mobile app is amazing and offers players a brilliant selection of games to choose from. Whether you’re accessing Landmark Bingo via Apple iPhone, Apple iPad, Android phone or Android Tablet, Landmark has got you covered. Players can claim £35 FREE when they join after depositing their first tenner. Players can also claim a 250% 2nd deposit bonus and a lovely 300% 3rd deposit bonus. Additionally, there’s a 20% cashback special available every week which allows you to get something in return every time you play. Landmark Bingo has an incredible mobile games selection that includes a vast range of slots and casino games. In total, Landmark Bingo Mobile has over 40 different games to choose from. Some of the top slots available include Queen of Legends, Rubies and Sapphires and Treasures of Egypt. For those of you who love to play casino games on the go, Landmark has all sorts of great games like Classic Blackjack, Roulette, Keno and many more. Their tremendous mobile games selection is sure to keep you satisfied when you’re on the move. Use Lord Bingo's exclusive Free Landmark Bingo Bonus Code LBNSPL5 to claim a one time £5 bonus. 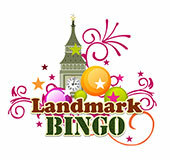 Use Lord Bingo's exclusive Free Landmark Bingo Coupon Code LBNSPL50 to claim a one time 50% bonus.